Just days ago Noel broke his silence on why he quit the group and said it escalated from a row about Liam wanting a free advert in the tour programme for his clothing brand. But in an interview with Radio 1, singer Liam said: "In my opinion - he's a control freak. He's making up lies to get brownie points." Noel claimed last week - as he revealed details of his debut solo release - that Liam had failed to turn up to an Oasis show at the V Festival in 2009 because he had a hangover, but blamed a bout of laryngitis for the no-show. Relations plummeted and Noel quit the line-up a week later just moments before a gig in Paris. But Liam stuck by the original story in an interview with Radio 1's Edith Bowman and said: "I got diagnosed with laryngitis for the V Festival - I wasn't hung-over. "I do gigs when I've been hung-over. I'm a big boy. I'm not going to cancel a gig because I've got a headache." Noel said last week that his brother - with whom he has had a rocky relationship for many years - had wanted a free ad for his clothes range Pretty Green. However, band-leader Noel said he had been unhappy with his efforts to get free advertising to sell to fans. 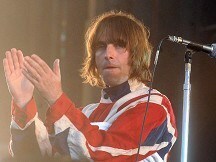 But Liam has hit back, responding: "I have never, ever had a conversation with him about Pretty Green or anything."